This traditional styled short length sofa adds a classic look to any room with its winged back design. Three pump seat cushions with three button-tufted back cushions offer firmer, comfortable seating for excellent support, with room for family and friends while you watch the big game. Available in a variety of fabrics, you can choose a design that suits your space. Slipcover also available. This stationary sofa is available in 70 inch and 78 inch sofas options. The 600 Traditional Short Length Sofa with Skirt by Lancer at Belpre Furniture in the Belpre and Parkersburg, Mid Ohio Valley area area. Product availability may vary. Contact us for the most current availability on this product. Fabric Options Available in a multitude of fabrics and finishes to accommodate any taste. Frame Construction Frames are built for lasting durability. Frames are inner-locked and glued with corner blocks and feature built-in legs where the design is appropriate. Seat Support Lancer product features their "Comfort Coil" System. Each unit has the coils placed properly in a pre-determined position. Each coil is produced of high-carbon spring wire and tempered to provide long lasting durability. Each unit has 9-gauge high-carbon, tempered wire support system to which the coils are attached on the bottom. The series of coils are attached to each other on top by a custom made plastic link and spring wire lace system. The outer perimeter of the coil unit is secured by a 6-gauge border wire. This forms a unitized seating surface. Padding & Ergonomics Patented superior rate 2.0 resiliency high-density foam cushions. It retains the majority of its original shape and comfort is better than most foam cushioning available today. Warranty Lifetime limited warranty for frames and springs, five-year limited warranty for cushioning, one-year limited warranty for fabric. Enhance your living room or family room with the traditional style of the 600 series. The classic design is reflected in the wing back design, skirted bases and slightly flared track arms. There is a large variety of fabrics to choose from as well as a matching loveseat and chair (not pictured). Create a comfortable seating arrangement in your home with the 600 collection. The 600 collection is a great option if you are looking for Traditional furniture in the Belpre and Parkersburg, Mid Ohio Valley area area. 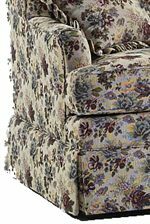 Browse other items in the 600 collection from Belpre Furniture in the Belpre and Parkersburg, Mid Ohio Valley area area.